Parks’ 6 Tots Gift Sets are ideal for presenting to friends, relatives, and loved ones alike. This set contains a collection of six candles custom crafted using aromatherapy principles to create an uplifting, rejuvenating atmosphere anywhere they are used. 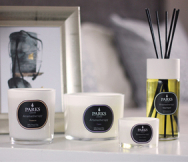 Each Parks ‘tot’ candle we produce is hand poured into a lovely clear glass votive mini vase, with one of our unique smokeless cotton wicks at its centre. Each will burn for up to eight hours, and rarely need to be trimmed. The Wild Fig, Cassis and Orange Blossom scent is one of our most popular, and is available in both 3 and 6 tot sets, each of which ships in a lovely presentation quality box. Wild fig presents a fruity, almost sweet scent profile that has been likened to both mint and jasmine, but is really something unique to itself. Considered to be a calming fragrance by itself, this serves to bind the other scents together harmoniously. Cassis, more commonly called blackcurrant, is an exciting and joyful scent which reminds many of us of our youth. Orange blossom adds a distinct spiciness to an already floral mix, and rounding out the whole to promote feelings of joy and renewed vigour. This has been called one of our most uplifting scents. These ‘tot’ sized candles are formulated to retain their scent for years, and crafted from the finest waxes and all natural essential oils to make sure they do so.